Ereada Corp is an American company focusing on creation of FIR mats from the natural Amethyst gems. The collection in Rich Brown color includes 5 mats: Mini, Midsize (Compact Pro), Pro, Single and Queen and 2 pillows. These mats are made in Korea by Hyundai Medical the FDA registered manufacturer. The main feature of the device 15 layers system is the thick Amethyst layer releasing FIR rays and negative ions. The 24"x59" Midsize mat contains 20 pounds of 100% natural untreated non-painted Korean tumbled purple Amethyst, the highest value for this mat size in the industry. Ereada Mat advantages are the thicker layer of gems, the most expensive A+ grade Korean Amethyst, N.P. function and High End soft suede. 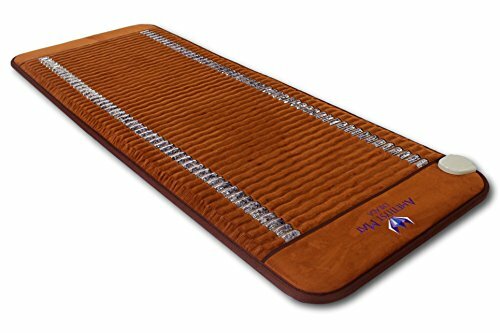 The mat is equipped with 7 intensity levels 68-158F double silicon EMF free Titanium heating system. Digital controller enables you to set the heating level and session time. Amethyst mat emits FIR and Mid infra-red rays with 93% efficiency in the most body absorbable wave length range 4-16 µm. InfraRed heat is structured by the amethyst layer to penetrate up to 8 inches deep into the body. Device creates intense heat improving blood circulation, metabolism and immune system. The mat produces Direct Current Negative Potential through the special N.P. Silver fiber layer. Negative ions are directly conducted to the body quickly restoring the cells natural electrical field and totally charging and alkalizing the whole body. The luxury wave lines design is distinctive by two clear vertical lines showing Amethyst gems, abundant under the entire brown suede wavy surface. Ereada mats are extremely durable built to last products.They come with a free protection cover and a full one year warranty. Our customer support service always respond within 24 hours 7 days a week. We are sure that you will like the results of the mat use after a few sessions or we will refund your purchase price. If you have any questions about this product by Bio Amethyst, contact us by completing and submitting the form below. If you are looking for a specif part number, please include it with your message.